Pope Francis wrote to the Bishop of San Miguel of his old haunts Argentina, about the proper interpretation of Chapter 8 of the Post-Synold Apostolic Exhortation Amoris laetitia. Recibí el escrito de la Región Pastoral Buenos Aires «Criterios básicos para la aplicación del capítulo VIII de Amoris laetítia». Muchas gracias por habérmelo enviado; y los felicito por el trabajo que se han tomado: un verdadero ejemplo de acompañamiento a los sacerdotes… y todos sabemos cuánto es necesaria esta cercanía del obispo con su clero y del clero con el obispo. El prójimo «más prójimo» del obispo es el sacerdote, y el mandamiento de amar al prójimo como a sí mismo comienza para nosotros obispos precisamente con nuestros curas. El escrito es muy bueno y explícita cabalmente el sentido del capítulo VIII de Amoris laetitia . No hay otras interpretaciones. Y estoy seguro de que hará mucho bien. Que el Señor les retribuya este esfuerzo de caridad pastoral. Y es precisamente la caridad pastoral la que nos mueve a salir para encontrar a los alejados y, una vez encontrados, a iniciar un camino de acogida, acompañamiento, discernimiento e integración en la comunidad eclesial. Sabemos que esto es fatigoso, se trata de una pastoral «cuerpo a cuerpo» no satisfecha con mediaciones programáticas, organizativas o legales, si bien necesarias. Simplemente acoger, acompañar, discernir, integrar. De estas cuatro actitudes pastorales, la menos cultivada y practicada es el discernimiento; y considero urgente la formación en el discernimiento, personal y comunitario, en nuestros Seminarios y Presbiterios. A careful and thoughtful reading of this letter produces neither heat nor light. First, this is not to the bishops of Latin America, but to one bishop. It seems that in Buenos Aires they are giving Communion to the divorced and remarried. But that isn’t really addressed in the letter, except by some sort of inference. This isn’t a smoking gun either for the liberals or conservatives, for dissidents or the faithful. It is written in a code. For example, “Simplemente acoger, acompañar, discernir, integrar.” What do those words really say? They are simply not so simple. In any event, just watch. Dissenters and libs will get their sweaty hands on this and, in the throes of a hyperparoxsysmic spittle-flecked nutty of elation, claim that the Pope told the entire body of bishops of the CELAM – nay, rather, the whole world – that they must give Holy Communion to the divorced and remarried. As I have stated before, those who are faithful to the Church’s teachings will probably continue to do what they did before the advent of Amoris laetitia and dissenters and liberals will continue in their own way as well. Remember: Our study of Amoris laetitia must be done through the lens of the Church’s whole magisterial body of perennial, previous teaching, including but not limited to the Catechism of the Catholic Church and Familaris consortio. Also, may I recommend once again this supremely useful tool? Priests, especially, should have it. I have heard that some priests are using this book with great effect in their preparation of couples for matrimony. Comment moderation queue is ON, as you might guess it would be. This entry was posted in One Man & One Woman, Pope Francis and tagged Amoris Laetitia, divorced and remarried. Bookmark the permalink. OTOH, wasn’t there a quote from Francis in which he said to someone at the Synod that if you want to change things, don’t do it directly because then it just causes opposition? I can understand about 98%. Pope Francis is endorsing a document we don’t have before us. He chooses to emphasize the need to be pastoral. There is no insight here into the interpretation of AL. It is important to know who released the letter. Why? Can we get someone like Trey Cardinal Gowdy to ask the Bishop of San Miguel about it? Who released it? To what purpose? Was it with the Pope’s permission? Even if it takes 12 hours of interview, do not accept the response: What difference does it make? Would it be impertinent, disrespectful, to pray for a “moderation queue” at the Domus Sanctae Marthae? The Holy Father was responding to a text of a “Región pastoral Buenos Aires” titled “Criterios básicos para la aplicación del capítulo VIII de Amoris laetitia.” Without that document, the Pope’s comments cannot be properly understood. The document (easily available on the internet) enumerates ten points. It stipulates (sort of as a last resort, having mentioned other solutions) that in certain cases it may be appropriate for some, living with an unmarried spouse, to receive communion. It says that this should not be a blanket permission but something based on individual discernment on a case by case basis. [ 7. Pero hay que evitar entender esta posibilidad como un acceso irrestricto a los sacramentos, o como si cualquier situación lo justificara. Lo que se propone es un discernimiento que distinga adecuadamente cada caso. ] Further, it makes a reference to a discernment that is “dynamic” and to the “law of gradualness” (la ley de gradualidad). Beloved brother: I received the written directive of the Buenos Aires Pastoral Region: “Basic criteria for the application of chapter 8 of Amoris Laetitia.” Many thanks for having sent it to me and I congratulate you all for the work you have taken upon yourselves – a true example of accompanying priests. We all know how necessary this closeness of the bishop to his clergy and the clergy to the bishop is. The one close – most close of all – to the bishop is the priest. And the commandment to love the one near to us as we love ourselves begins precisely for us bishops with our priests. The directive is very good and lays out fully the sense of Chapter 8 of Amoris Laetitia. There are no other interpretations. And I am sure there will be great benefit. May the Lord reward you for this effort of pastoral charity. It is precisely pastoral charity that moves us to go out to encounter the alienated and once encountered to initiate a path of welcome, accompaniment, discernment and integration in the church community. We know that this is tiresome, it concerns pastoral effort that is literally side by side, an effort not satisfied by programmatic interventions, organizational or legal, no matter how necessary these things might be. Just to welcome, accompany, discern and integrate. Among these four pastoral approaches the least practiced is discernment. And I consider urgent formation in discernment both individual and communal in our seminaries and priestly groups. Finally, I wish to remind that Amoris Laetitia was the fruit of the work and prayer of the entire Church, mediated by the synods and the pope. And so I recommend to you all a complete catechesis of the Exhortation, which will surely help the growth, consolidation and health of the family. Again, I express my thanks for the work that was done and I encourage you to continue in the forefront in the diverse communities of the dioceses with the study and the catcchesis of Amoris Laetitia. Please don’t forget to pray and to pray for me. May Jesus bless you and the Holy Virgin care for you. Dear Father: The letter was sent in response to the document “Criterio para la aplicación …” (Criteria for the aplication of Chaper VIII of AL) sent by the Pastoral Region of Buenos Aires (conformed by the Bishops of the City of Buenos Aires plus 10 other surrounding Dioceses). Now this document was drafted for the clergy, not for the faithfull in general nor for public disclosure, and as such, was ordered to be kept “reserved” by the Priests. However (this IS Latin America after all), the document was leaked and caused some concerns among the local clergy. Yesterday, Thursday 8th., there was a meeting in the Buenos Aires Archidiocese (sorry the spelling), and some Priests voiced their concerns with the document in question. Two of those voices were the Archbishop of Buenos Aires and my own parochial Priest (also a well known canonist). Both of them very clearly expresed that communion can only be given to those irregular unions living in chastity, and in general giving an orthodox approach to the matter. So, in the end, the document is to be revised and its most “offensive” parts to be re-written before sending an official final version the Pope. That is why here the letter from Francis was such a shock, since it states that “there is no other interpretation”. I must say that I was not able to read the document yet, so I am afraid I am only giving a version of what happened yesterday as told to me by some who were there and read the document. And clearly we must read first what was sent to the Pope before judging what he said here. Since the moderation queue is on, I will understand if you decide not to post this. 4) Este camino no acaba necesariamente en los sacramentos, sino que puede orientarse a otras formas de integrarse más en la vida de la Iglesia: una mayor presencia en la comunidad, la participación en grupos de oración o reflexión, el compromiso en diversos servicios eclesiales, etc. 6) En otras circunstancias más complejas, y cuando no se pudo obtener una declaración de nulidad, la opción mencionada puede no ser de hecho factible. No obstante, igualmente es posible un camino de discernimiento. Si se llega a reconocer que, en un caso concreto, hay limitaciones que atenúan la responsabilidad y la culpabilidad (cf. 301-302), particularmente cuando una persona considere que caería en una ulterior falta dañando a los hijos de la nueva unión, Amoris laetítía abre la posibilidad del acceso a los sacramentos de la Reconciliación y la Eucaristía (cf. notas 336 y 351). Estos a su vez disponen a la persona a seguir madurando y creciendo con la fuerza de la gracia. These are two fairly strong limiting conditions — “inability to obtain an annulment” is code language for an uncooperative spouse who has left the Church but refuses both to canonically recognise his or her own defect of matrimonial intention, AND refuses to legally recognise the existence of the existing Sacramental marriage (ie hostile spouses who have forced a secular divorce and have remarried and entirely turned their backs on the Church) ; and the second condition, of canonical limitation of responsibility of the person in question, requires actual concrete conditions whereby responsibility is actually and objectively diminished versus the Sin. 7) Pero hay que evitar entender esta posibilidad como un acceso irrestricto a los sacramentos, o como si cualquier situación lo justificara. Lo que se propone es un discernimiento que distinga adecuadamente cada caso. Por ejemplo, especial cuidado requiere «una nueva unión que viene de un reciente divorcio» o «la situación de alguien que reiteradamente ha fallado a sus compromisos familiares» (298). También cuando hay una suerte de apología o de ostentación de la propia situación «como si fuese parte del ideal cristiano» (297). En estos casos más difíciles, los pastores debemos acompañar con paciencia procurando algún camino de integración (cf. 297, 299). So, anyone who thinks that a situation of adultery can be compatible with Christian Faith, or “justified”, can have no access to the Sacraments. 8) Siempre es importante orientar a las personas a ponerse con su conciencia ante Dios, y para ello es útil el «examen de conciencia» que propone Amoris /aetitia 300, especialmente en lo que se refiere a «cómo se han comportado con sus hijos» o con el cónyuge abandonado. Cuando hubo injusticias no resueltas, el acceso a los sacramentos es particularmente escandaloso. And in certain cases where no manner of having sinned is understood by the penitent, access to the Sacraments is described as being particularly scandalous. It’s not the Kasperite “solution”. I haven’t had a chance to analyze all this, and so have no opinion yet, but here is an article from LSN that contains translations. Father, your interpretation baffles me. The bishops’ document clearly states the Kasperite view: “Si se llega a reconocer que, en un caso concreto, hay limitaciones que atenúan la responsabilidad y la culpabilidad (cf. 301-302), particularmente cuando una persona considere que caería en una ulterior falta dañando a los hijos de la nueva unión, Amoris laetítía abre la posibilidad del acceso a los sacramentos de la Reconciliación y la Eucaristía (cf. notas 336 y 351).” And the pope just clearly said: “No hay otras interpretaciones.” Ergo, Pope endorses the Kasperite solution. What am I missing? JabbaPapa, your comments on Father’s blog always offer excellent insight. If you had a blog, I would read it. The stalkers that dog me have made that impossible for the time being. Ever since Francis described the “Kasper proposal” as “serene theology”, it’s been obvious to all but the most intransigent Pollyannas that this was the game plan. This is rupture. A complete break with Familiaris consortio. The Holy Father is not one to mince his words (well actually yes he is) but I digress . If he wanted to end this confusion, he would simply speak clearly. He has chosen to not to – so that says it all. A Jesuit who becomes a bishop remains a Jesuit. Father Z: In fact, both the Bishops Statement and Pope Francis’ affirmation in his letter concerning same while offering warm approval of their interpretation and practice 204 Holy Communion to those living in irregular sexual relationships constitute a clear, unequivocal break with the Church’s moral teaching and Sacramental practice from its very foundations, as taught by Christ and the Apostles themselves, as well as the notable teachings of Saint Paul on the worthiness required for receiving Holy Communion. This can no longer be denied without culpably placing both a stumbling block and obstacle before the Faithful (priests and laity) who should rise up as a single body to protest and put an end to what amounts to Church sanctioned sacrilege and confirmation of sinners in their sins. Muret, hadn’t the Archbishop of Buenos Aires, Cardinal Poli, previously been FOR allowing the divorced and “remarried” to receive Communion? P.S. further to my comment above….we ALL have to pay a price to win Heaven. For you have not yet resisted unto blood, striving against sin. We must be ready to pay any price in the war against sin. That’s not what the Pope and Bishops are teaching the faithful. Our Lord said we must be ready to pluck out our eye, or cut off our hand if either is an occasion of sin. 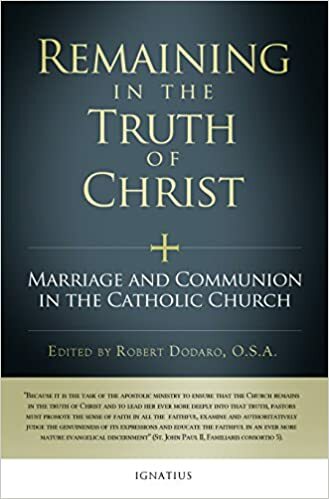 As Muret already mentioned, the letter of criteria was supposed to be something “private,” but it openly said that communion could eventually be given to people in adulterous relationships, even in some cases where no chastity was practiced. It seems (it is rumored) that the one who wrote that letter was Msgr. Tucho Fernandez (the Holy Father’s right hand man and ghost-writer who wrote the book on the art of kissing!). When all of this became public, there was a meeting to discuss the letters (on September 8th). At that meeting, as Muret already said, Cardinal Poli and a Canon Lawyer (Msgr. Pinto) expressed opposition to the original letter and many priests and some Bishops expressed criticisms of the letter from the Holy Father as well. It seems that the letter was leaked by a priest (since they were the ones who got the copy of the letter in the first place), and in opposition to the request that it be kept private (liberals like that: they want everything to be kept secretive in order to gain time). Before the “official” letter to the priests is sent as an official document to help with the interpretation and application of AL, there will be revisions and modifications. The question is: Will Msgr. Fernandez (and/or the Holy Father) allow this? It is possible that the names of those who opposed or criticized the two letters will be added to the list of those whose heads will roll next in Buenos Aires! … Vindictiveness in high places has been rampant in this Holy Year of Mercy! IMHO, the problem with all this is that it reduces the entire problem of divorce and remarriage to a personal matter of Confession and or Holy Communion. [But not without the help of a confessor.] If wobbly moral theology or juridical soft shoe is utilized to encourage people to return to mass and go to Communion, it doesn’t change the fact that aefamily has been destroyed (1). [One of the other comments brought up the issue of “what about the children from the previous family?” A good point.] There is still the possibility of the mother on one side of the church and the father on the other–with children randomly distributed between the two, and with one or both parents accompanied by a new spouse and step children. IMHO, this entire approach is typical Counter Reformation Jesuit theology, in which the Ecclesial component of the act is not sufficiently considered. [An interesting way of thinking about this. I wonder if your namesake St. Robert Bellarmine, SJ, would have comments about this controversy.] Someone’s relationship with the Mystical Body of Christ is not merely with those who are physically present at mass. Nor is it merely with those who are no longer living. It is both. (1) Not to excluded the generously granted annulments over the past 40 years.